The Party Ain’t over ’til the Fryeds go home,” goes the song written by legendary biker-bandleader Harry Fryed. He ain’t kidding either. And after 34 years the party is still going strong, while the award winning Fryed Brothers Band has been on the road carving out a reputation as the best biker band in the world. Their energetic brand of American roots music is an irresistible stew of country, blues, swing, boogie­woogie and good old roadhouse rock and roll. Sure, many plow these musical fields but few reap the success that the Fryeds have. Why? Because they simply are the best. Their incredible musicianship, entertaining performances and reliable professionalism have elevated them head and shoulders above the pack. Ask anyone. From George “Rip” Rose, of Easyriders Magazine, who called them “the epitome of biker bands” to Willie Nelson who released their CD, “the Roar of Dirty Thunder” on his Pedernales Records label, singing the title duet with Harry Fryed. Harry and Tommy Fryed started the Fryed Brothers Band in 1980 in memory of their older brother Mark. For 34 years they have toured relentlessly, not only in the USA, but also Canada, Australia, New Zealand and Thailand. They currently have 4 CD’s with a DVD “Live at the Doghouse”. They have headlined every major Motorcycle rally in the country, as well as being regular performers at Willie Nelson’s annual Fourth of July picnic. The laundry list of people they have shared stages and played with, is a wide­ranging who’s­who of American music: Willie Nelson, Marshall Tucker Band, Johnny Paycheck, Waylon Jennings, Charlie Daniels, the Doobie Brothers, Jefferson Starship, Nazareth, Steppenwolf, Tower of Power, John Mayal, Commander Cody, Asleep at the Wheel, Edgar Winter, Freddie Powers, Eric Burton, Elvin Bishop, Eddie Money, John McKuen, David Allen Coe, the Nitty Gritty Dirt Band, Canned Heat, Gary Morris, Leon Russell, Blood, Sweat & Tears, Billy Idol, the Fabulous Thunderbirds, Pink and many, many more. Those who might pigeonhole them as “just” a biker band would be sorely missing the point. With their wide­ranging blend of good­time American music, they’ve successfully crossed over those narrow boundaries. They’ve rocked crowds at such diverse venues as Cal Expo and the 2002 Winter Olympics. They’ve appeared at rodeos and county fairs all over California. Every year they play the Redwood Run in Piercy CA. And, were at one time the west­coast back­up band for the late, great, country music legend Johnny Paycheck. Wherever they’ve appeared, whatever the venue, for 34 years the Fryed Brothers have proven time and again, that they are a great American band, period. 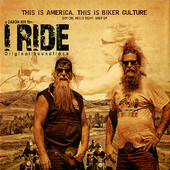 Check out their movie, I Ride and the I Ride soundtrack ­ the very best of the Fryed Brothers.